Hope you are all doing well and having a fabulous weekend! I am very much enjoying a lazy Sunday relaxing the the garden whilst catching a few rays. I have a busy week ahead so i am fully taking advantage of the last few days i have to rest up and be carefree haha. 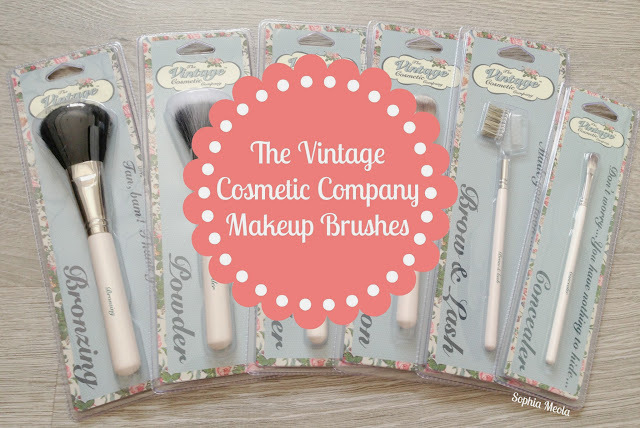 Todays post is going to be a review of some amazing makeup brushes from 'The Vintage Cosmetic Company'. Just before i jetted off the Barcelona they very kindly sent me a few goodies to try out and i have been loving experimenting with them! First up are these very vintage esk makeup brushes which have been making an appearance in my daily makeup routine! I do love my makeup brushes and have quite a large collection...a girl can never have too many! 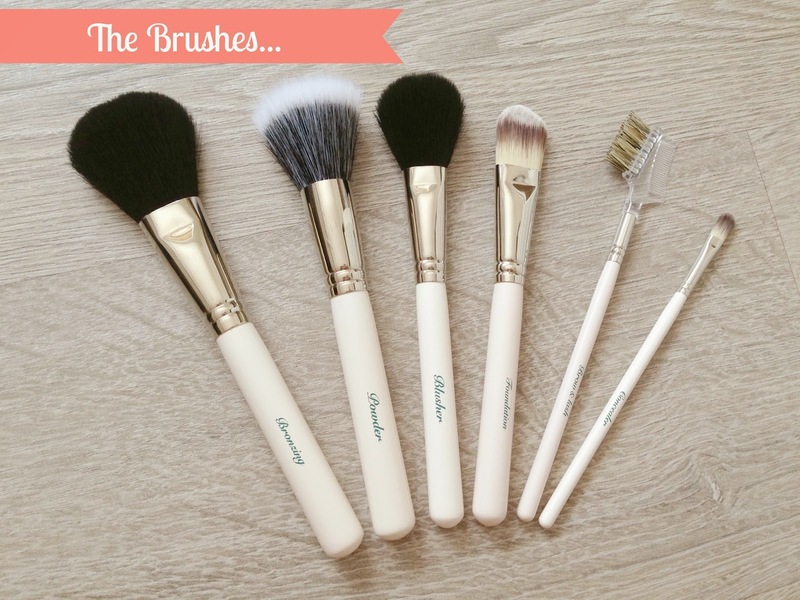 Firstly, i am a huge packaging girly and when i first set my eyes on these gorgeous brushes i instantly fell in love. The packaging goes incredibly well with the 'vintage' theme of the brand and i absolutely adore the chosen colour palette! 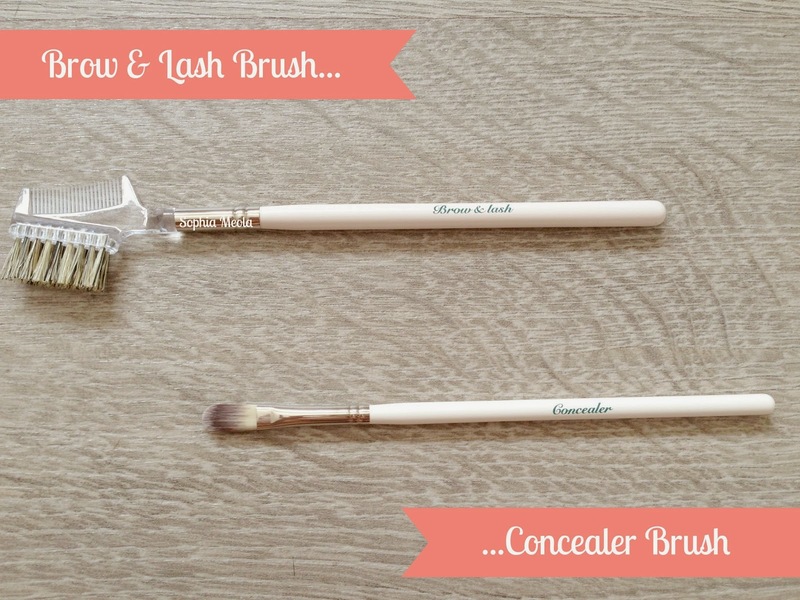 The packaging was extremely sturdy and the brushes are well secure and protected. They were a little fiddly to take out of the packaging but pretty much all of this type hard plastic packaging is tricky to open haha. 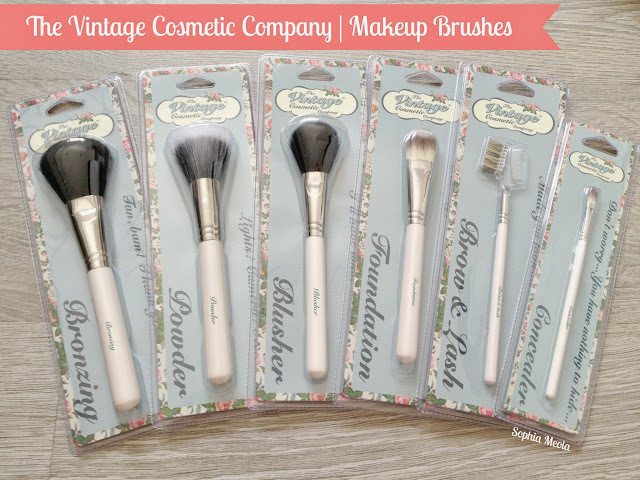 I was very kindly sent 6 lovely brushes from 'The Vintage Cosmetic Company' brush line and they are all types of brushes i love using on a regular basis. I adore the fact that they have 'The Vintage Cosmetic Company' logo on one side and then when you flip the brush round you have the name and purpose of the actual brush...love it! Even though they each brush has their own purpose you could still use each brush for various different makeup duties. After removing the brushes from the packaging i was instantly taken away at the fact they are incredibly soft! The handles are cute white/creamy shade which yet again ties in with the vintage theme. After browsing through the website i also discovered you could choose a dusty pink option which would also look incredibly cute. First up is the 'Bronzing Brush' which is a large domed makeup brush with natural bristles which is perfect for maximum application with precise control. Whether you are going for a bronzed goddess look or for a natural everyday look this is a perfect brush for applying your bronzer. However, like i stated earlier this could also be a great all rounder when it comes to applying powder products to the face. I feel it could work amazingly with setting powders and even a mineral powder foundation. 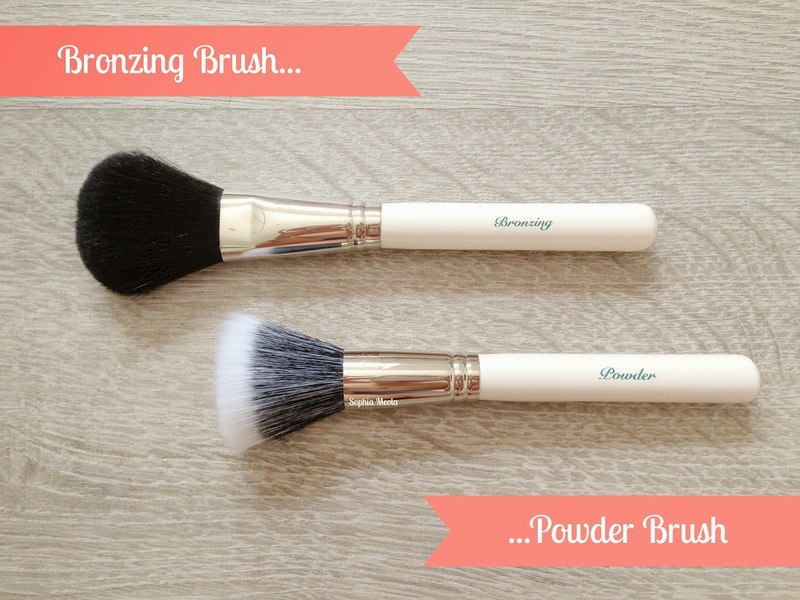 This duo fibre 'Powder Brush' allows you to apply your face powder effortlessly. It is perfect will all types of powders and helps to create a flawless base. Yet again i feel this could be an extremely versatile brush when it comes to your makeup bag. Not only is this a great brush to apply powders, i feel it could be amazing to work foundation into the skin. The combination of the duo fibres and the large size it would make a perfect brush for liquid, cream and powder foundations. 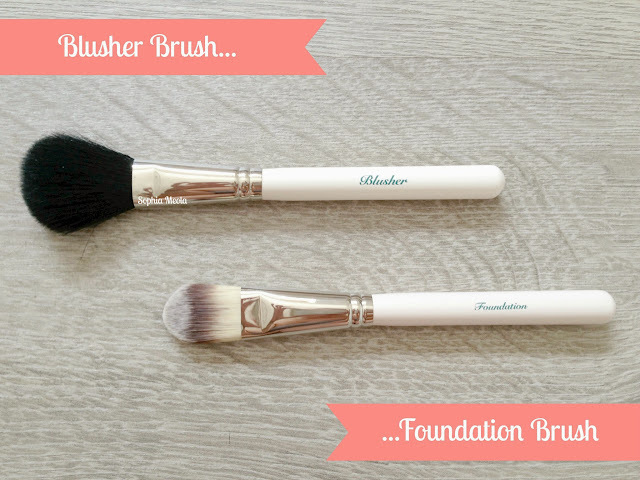 The 'Blusher Brush' is made of similar natural bristles to the 'Bronzing Brush' and is the perfect size for blush application. It is extremely soft and sweeps colour onto the cheeks effortlessly. Not only is this a lovely blush brush i have also been using it to apply my favourite highlighters. It is the right size and applies the highlighters perfectly along the cheekbones. The 'Foundation Brush' is specifically designed with synthetic bristles so this is the perfect brush to use with liquid and cream foundations. This is almost identical to the MAC 190 and is a great foundation brush for creating a flawless finish to the skin. When it comes to applying my foundation i do prefer using a stippling brush as preference, however, this is still one of the classic foundation styles i grab for when using particular foundations. Even though this is a foundation brush, i also in the past have used these types of brushes to apply cream or liquid highlighter and it works a treat also. The 'Brow & Lash Brush' is one hand little tool and i seriously do not know what i did before i ever was introduced to these. It is a vital component in my daily makeup routine to groom my brows and get them prepped for eyebrow products and this is a little gem. It is quite a large size which i love as i feel you have more control when using it. The 'Concealer Brush' is such a handy little brush and has come in super handy with my daily makeup routine. Whether you are using a concealer stick, powder or liquid this brush will help disguise those pesky imperfections. It's quite a dainty thin brush which is great at getting in those small hard to reach places right underneath your lash line. I find i can really concealer dark circles with this little gem, it aids with maximum coverage what leaves a flawless applications. Overall, i am extremely pleased with these makeup brushes and have really enjoyed incorporating them into my makeup routine. Each brush has their own little talent but they can also be doubled up and used for various different makeup tasks. They are amazing quality, very sturdy and wash up lovely after having a deep clean and also when spot cleaned with my MAC Brush Cleanser. I already have my eye on some more of their brushes after trying these beauties out, so expect another cheeky review coming your way soon! 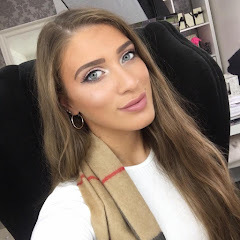 Hope you enjoyed this post, i would love to know what your thoughts are on the brushes, if you have tried any and what your all time favourite makeup brush is! As always lovelies, if you have any questions or requests pretty please do not hesitate to get in contact with me either by leaving a comment below or my contacting me through my social media platforms. I seriously love reading through all of your comments...it makes my day! I love the packaging - so pretty. My favourite make up brush ever is without a doubt the Real Techniques Expert Face Brush. It just does everything. Hi Lovely, Love your awesome blog. Gorgeous! I am your newest follower from Blog Hop and followed you via Bloglovin', FB & GFC. I loved these brushes too - I may have to get some more! I love these brushes I have the eye shadow brush. Really looking forward to try these brushes out! Picked up the concealer and the duo fiber powder brush tonight but I can't get myself to take them out of the packaging!